Personalized royal blue & white 32” golf bag umbrellas can steal the show before the actual golf match begins! White and royal blue forms a very royal combination, which always leaves a person mesmerized. Logoed promotional royal blue & white 32” golf bag umbrellas can be best utilized by marketers who wish to position themselves uniquely amongst niche crowd. No one can miss the sight royal blue -white umbrella sheltering a golfer’s bag because of the brilliant visual appeal that it forges and they are prone to get closer and analyze the details imprinted over the umbrella. Equipped with a sturdy handle, and nylon fabric canopy, this manual open umbrella an attract attention from distances. 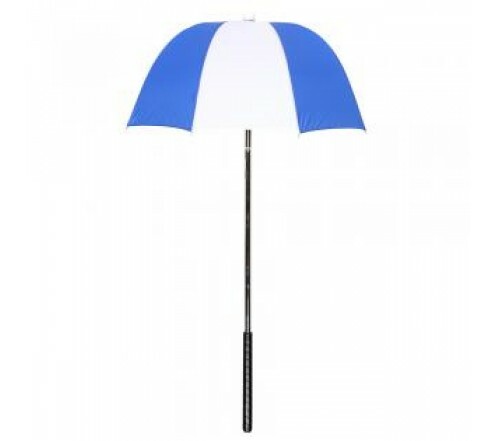 Custom royal blue & whit e32” golf bag umbrellas can be favored by big budget as well as newbie businesses to build their brand values during the sports season. Dimensions - 32" arc - Closes to 41". Imprint Area - 4"W x 4"H.